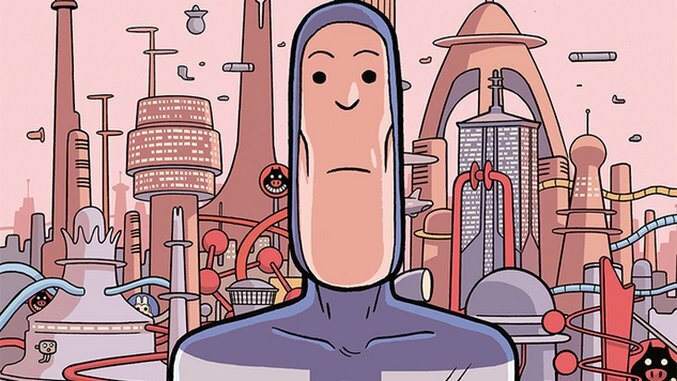 It’s an interesting time for Fantagraphics to release Lucas Varela’s graphic novel The Longest Day of the Future. Published in France last year by the Argentinean comics creator, it reads like Norwegian cartoonist Jason’s quirky work, only writ a bit larger. Set in a dystopian, but very clean, future in which two large corporations (one red, one blue) battle for control of our wallets while demonizing each other, one can certainly read it as an allegory for our current electoral season. Then again, Varela isn’t American, and he’s just writing about the negative side of binaries in general. Or… maybe not. If one does choose to see it as mappable onto the narrative of Republican vs. Democrat (red vs. blue), it might make one a little sad to see the two sides as, essentially, no different from each another, their differences solvable only through [spoiler alert] alien intervention and violence. It’s a pessimistic way of looking at the fix America finds itself in, as arguments become more and more polarized—the equivalent of those bumper stickers reading “Giant Meteor 2016.” It’s a shallow way of thinking, where small differences mean nothing. All that said, the book is excellent. Like Jason, Varela renders his characters with long, thin limbs and long, oblong heads. Their mouths, if they express more than a thin line of studied neutrality, twist down with sadness or rage. Within these pages, Varela expresses much wistfulness, offset against rage and tribalism. The desire not to do things, à la Bartleby, The Scrivener, is presented as a clear good in comparison to the terrible actions that take place. Varela’s color palette of pale pinks and blues, with occasional browns, reds and grays, adds to the restraint of his images, as does the fact that he tells almost his entire story without words. There are a few expressive lines for the purpose of communication—a squiggle of confusion, some straight lines radiating from the head for surprise—and the word “zank” repeated as an alarm, but most of it happens through body language, and it’s impressive how much he can get across. Varela renders the tangle of wires and pipes, cables and helping hands that descend from his ceilings cleanly, but also suggests the increasing mechanization of our lives. At the same time, some of those machines are more sympathetic characters than the humans who create them. The book is darkly funny—or is it deeply sad? It’s hard to tell, but that may have more to do with the present era than with the work of art itself.